Genius Loci Games: Quick Note - No thieves for you! Work on Eldritch Shadows continues in the form of notes and such as I pound away at the material for the Pyramid of the Lost King Kickstarter. Which means a lot of things I talk about when it comes to the Modern Supplement for Swords & Wizardry are still in flux and may change by the time I'm either ready to release it or Kickstart it. Last time I introduced the revised rules for sanity and checks. This time I have no rules but merely ideas I'm currently playing with within the system. 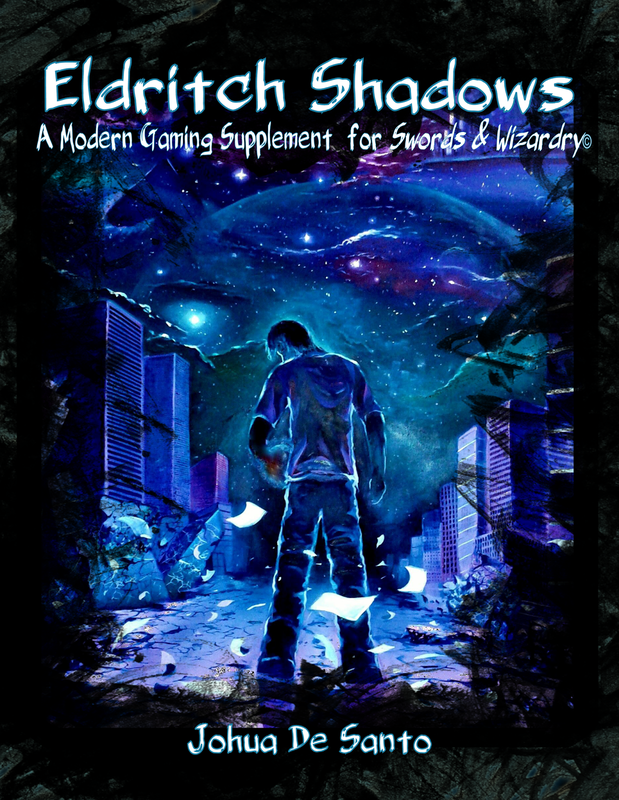 Eldritch Shadows is currently slated to feature 6 classes based on the 3 classes presented in Swords & Wizardry Core. These Classes are: Fighter (Soldier, Street Thug); Cleric (Missionary, Templar); and Magic-User (Street Practitioner, Council Mage). As you see there is no class or classes based on the "thief" of Swords & Wizardry. As you can see Move Silently and Hear Sounds are not present. This is because those are now considered to be part of the Ability Check system and would fall under Wisdom and Dexterity respectively. Currently these previous thief skills are referred to as "street skills" in my notes ... but that may change as I move forward. Currently Armor Class as we know it in Swords & Wizardry has been modified to be 10+[dex or wis]+Class modifier. Every class has a base defense score that is augmented by what their Dexterity or Wisdom is (take the higher of the two). So a Street Thug with a 14 in Con would have an AC of 15. Unlike Swords & Wizardry armor does not affect the AC (which I'm thinking of renaming Defense). Instead a peace of Armor's rating is treated as a damage reducer. So a Kevlar Vest (The best armor in my current build) gives a 4 rating. This means that all damage that is four or under is halved. So if our Street Thug is wearing Kevlar and is hit for 5 damage he only receives 3 points of that damage. One concept I'm chewing on and may abandon completely is "wear" on armor. So Kevlar has a rating of 4 which would give it double that rating in durability, so 8. Once the Kevlar reduces damage 8 times it has become to battered to be useful and no longer reduces damage. This is a concept that would help with some aspects of player mortality but is also just that one bit of extra rules that is chafing me the wrong way. So, that is the Eldritch Shadows update for ... the month? Who knows. Tonight I get out of the house and get some major work done on the Pyramid side of things as I continue to revise the alpha manuscript for hopeful editing.